Is your pet suffering from an uncomfortable and unattractive skin infection? Malaseb Shampoo is your cure. The antifungal and antibacterial medications in this unique shampoo work together to relieve problems with dandruff, ringworm, yeast, and other bacterial infections. The main ingredients, Miconazole Nitrate, an antifungal agent, and Chlorhexidine Gluconate, an antimicrobial compound, work together to fight dermatitis-causing microorganisms in your pet. Malaseb Shampoo has no fragrance and is free of dyes, making it an appealing shampoo for regular cleansing of your dog's skin and coat. For best results, the shampoo should be used twice a week until the symptoms of the infection begin to subside. The solution should have at least 10 minutes of contact with your pet's entire body when bathing. There's no need for your pet to endure the discomfort of a skin infection. Malaseb Shampoo is your best choice for relief. If any side effects occur, discontinue use of the shampoo and contact your veterinarian. 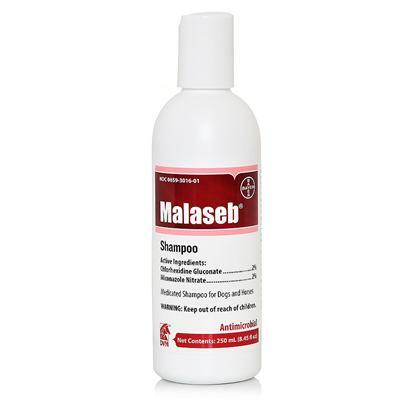 Malaseb Shampoo is for twice-weekly until the symptoms desist, or unless otherwise directed by a veterinarian. To administer, rinse your pet’s coat with warm water and apply the shampoo, working it into a lather and allowing it to sit in the coat for 10 minutes altogether. Rinse the lather from your pet.